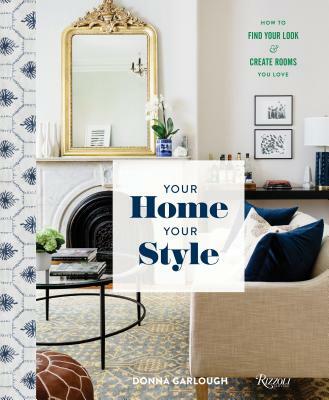 The first book from the style director for the popular home decor site Joss & Main is a lively, chic road map to finding and implementing your style at home. In this age of Instagram and Pinterest, there is no shortage of decorating inspiration. Then why is it so hard to make the leap from pictures bookmarked and saved, to the guts to decorate your own home? In Your Home, Your Style, Donna Garlough urges readers to adopt a new decorating truth: whether you are renting or renovating, staying or going, it is always a good time to decorate. And the best person to do it is you. Your Home, Your Style is not just a guide to decorating, but a guide to understanding your style strengths, identifying and overcoming your design weaknesses, and figuring out how to put the furniture, decor, and details you love into your home in a way that works for you. Enriched with easy takeaways (how to style a bookshelf four different ways; how to create a gallery wall), and illustrated with polished attainable spaces styled by the author as well as other home decorators, this is a guide rich with real-life know-how that deserves a place on every home decorator’s shelf. A longtime magazine editor, Donna Garlough has been the style director at Joss & Main since 2013. She is the coauthor of The Green Guide, and her writing, projects, and advice have been featured in Real Simple, Family Circle, Country Living, InStyle, ElleDecor.com, People.com, PopSugar, the Wall Street Journal, the Washington Post, and the Huffington Post, among other publications. Joyelle West is an interiors and lifestyle photographer based in Boston. "Her book is not just a guide to decorating, but a guide to understanding your style strengths, identifying and overcoming your design weaknesses, and figuring out how to put the furniture, decor, and details you love into your home in a way that works for you." "This book, written by the style director for Joss & Main, teaches you how to understand your own design strengths, weaknesses, and how to create a home you will truly love."